Verdict: 3.75 / 5Finally understanding where the narrative is headed, Harley Loves Joker #2 managed to surpass my expectations. Issue 2 of Harley Loves Joker is absolutely a step up for this miniseries, as it concludes the narrative in a decisive fashion. Featuring everything I praised in the first issue, whilst actually adding multiple dimensions to Harley Quinn, Harley Loves Joker #2 does a good job in following up its predecessor and surpassing it in terms of character development, cameos and just fun. Showing us what life is like for Harley now that the Grinson is part of the Joker gang, the title does wonders for the character in exploring her mind and inner voice; with multiple Harley’s (and her mum) battling out inside her head for supremacy of Harley’s actions and choices. With all the mad fun and simplistic plot to foil Grinson, we are reminded throughout that although Harley seems to be at the Joker’s mercy, she is her own woman, no matter what those voices in her head say. Harley consistently makes her own choices throughout, some of which may come back to bite her, but choices that keep the world running for herself and Mr J. The Grinson throughout this miniseries has still left a lot to be desired, however. Revealing the fact she had outsmarted the Joker was a nice touch, but the twist could be seen from a mile away. Her motivations still remain weak at best. She looks for fame and fortune in offing the Joker, but to use to what ends is hard to say. She also proved no match for Batman, who captured her in one fell swoop. This only complicates how powerful Joker is being displayed here, seemingly being the slowest in the room next to Grinson and Harley. The Batman cameo itself was fun and expected at some point and the return of the Wonderland Gang delivering on their promise was good continuation. I would like to see more from them in the future as this colourful cast could add a lot of fun and menace to any book they are in. 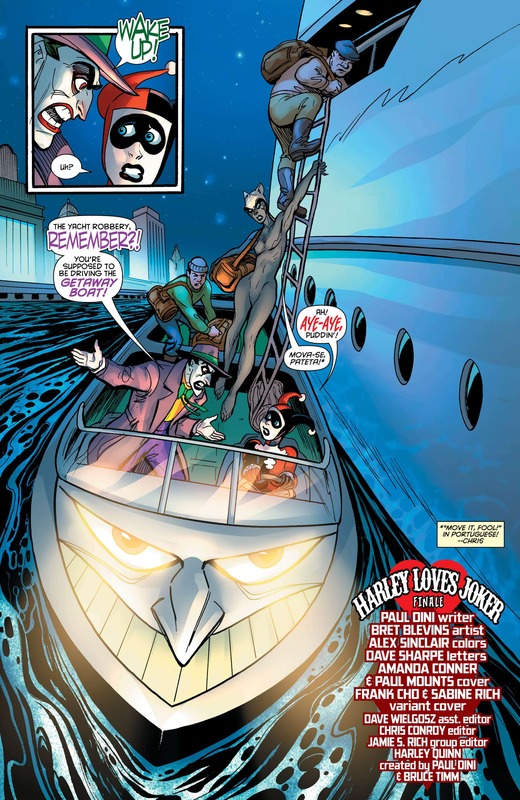 Harley Loves Joker fails, however, to extend the world any further from the previous issue, continuing to play upon the same locations, characters and themes. The new weapon discovered to affect emotions might be setting up something for the future, especially when Harley called out the fact it was more fit for Mad Hatter or Scarecrow. Perhaps we’ll see more of it soon from one of these villains or maybe it was just a side point that will be forgotten eventually. Overall, Harley Loves Joker #2 is far superior to the first and perhaps improves aspects of it upon a second read. A character that has so many layers deserves to be explored further in this wacky world and I can’t wait to see what else comes out of this miniseries. What’s more, the art was still fantastic and really added to the kinetic energy throughout this book.